Hi and Happy New Year’s Eve! Well this is it. The last day of 2015. It’s definitely time to close the door on this year and open the door to 2016. To help the process along, I already shared a 2016 Printable Monthly Calendar and today I’m adding a weekly planner page. I have been using a weekly planner page for about a year. I started out with a yellow legal pad…it was definitely not fancy but it worked. A few months ago I made a plain weekly template, printed a few and put them on a clipboard. I keep the clipboard with my calendar and other blogging stuff. It has made such a difference. I still keep a monthly calendar but I put more detailed info on the weekly planner along with quick notes of things I need to do that day. I don’t know about you, but I make mistakes and need to make changes, so I always use a pencil. Keeping track of everything we need to do, every day, can sometimes be a daunting task. The older I get, the more I need things written down so I don’t forget something. A monthly calendar used to do the trick, but a weekly planner page simplifies everything and has worked much better for me. I hope it works for you too. 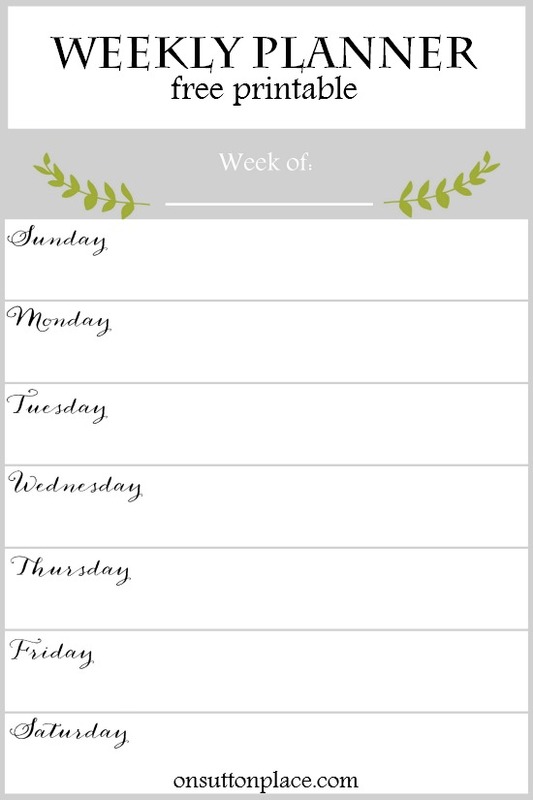 Click to download the Weekly Planner Free Printable. 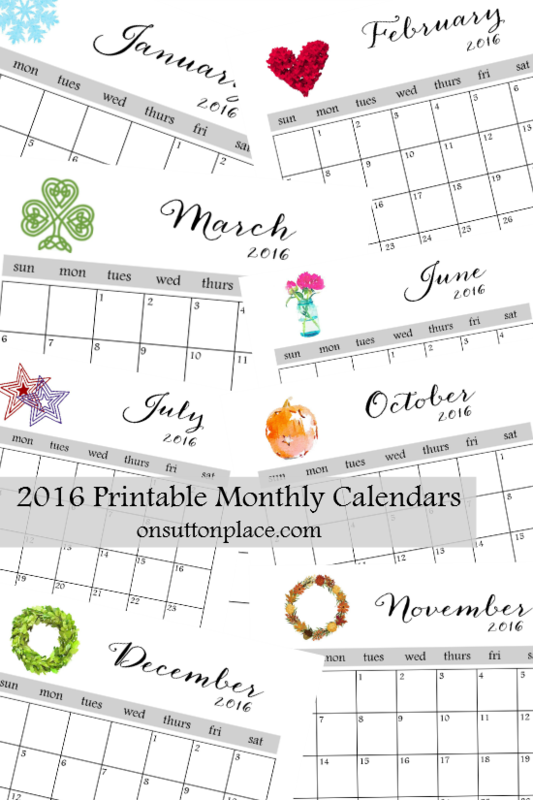 To check out the 2016 Printable Monthly Calendars just click HERE. I’ll be back tomorrow with a New Year’s Day sale in my online shop. Stay safe tonight and have fun! Love all your printables. I enjoy changing the prints when all the seasons change. They are Beautiful and the themes remind me of me. Thank you from my heart. I love your printables! Thanks so much for sharing them! So glad I found you today! I look forward to your emails in my inbox, and all your fun decorating ideas and recipes and tips! Have a wonderful 2016! You have a lovely style! Hi Ann, Thanks for these printables. I downloaded them, but have a question/request. Is it possible on my end to edit the one week printable so it fits two of them per page when printing? I like it, but think I would use a smaller version better and it would save wasted paper. Many thanks for all you do! 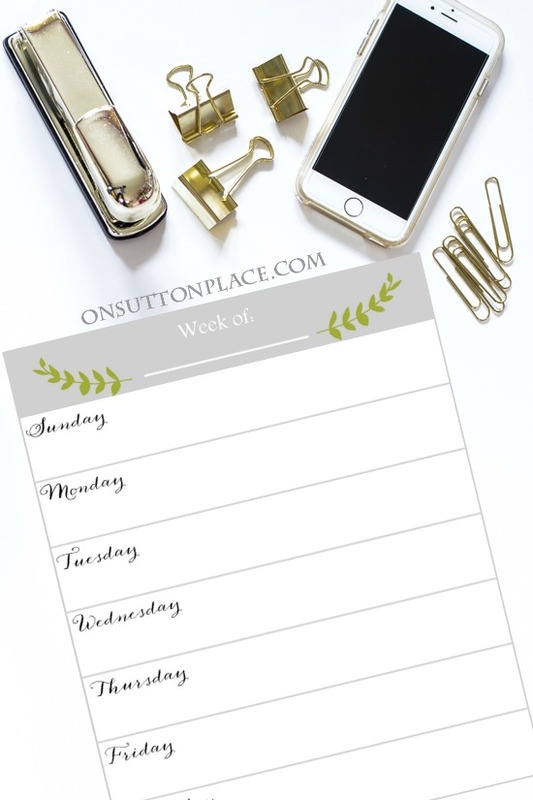 Thanks so much for the pretty printable weekly planner….I travel a great deal for work so I use a monthly planner to plan my travels. I use a weekly planner to jot down, dinner plans, clothing selections so I am not an outfit repeater! And I use it to make notes on what needs to be done task wise on a specific day! I just printed 52 and am set for the year! Wishing you and your family much happiness in 2016. Thank you. I was just thinking that maybe I need something like this to jot down daily what I need to do after work. I tend to fall into a routine when I get home and forget what I was suppose to do. Thank you for the printables. Love all your posts and creativity. Blessings being sent your way for a wonderful 2016! Just wanted to say thank you for all the posts the past year. Happy New Year! Re your Rosemary potatoes -saw Jamie Oliver do a similar recipe. He put sea salt & garlic in also. Delicious! Thank you, just what I was looking for. Thank you so much for the printable. They are so pretty. That’s what makes it fun to use. Thank you from France for the calendar… It’s very nice !!! I love this post. The printable calendars are a lovely and useful surprise. Thanks for the gift. You always have wonderful ideas and we are lucky you share. Looking forward to your postings in 2016. – I always use weekly calendars for posting my daily meals on the fridge …now I’m going to use yours – Thank You! Happy New Year, Ann. Thank you for sharing your lovely home, decorations and crafts with all of us. I look forward to every post. Your blog is one of the very best. So well done and the staging and photography is outstanding. Hi Ann, thank you so much for the calendar and weekly planner printables. You did a wonderful job on them. I have already printed them all, came out beautifully and I know I will enjoy using them all year. Ann, thank you for all the ways you have blessed me with your blog posts in 2015. Such classy ideas and printables. I look forward to more “good stuff” in 2016!